My daughter is my little Diva. She is not like a prissy pants girl, but a girl that loves to style and loves to show off her fashion sense for all to see. She is only 6 going on 7 and she is a 6 year old that is on top of the latest trends that are in the little girls fashion community. She really loves her purses, which I dont know if that is a good thing, but she loves to carry purses around with her when she goes places. Another thing she loves to do when we go out is bring one of her dolls with her. So when I was given a Plush Purse to sample and review, courtesy of Aurora, I knew that this purse would be perfect for my daughter! Since we are in the Princess Party Event, the Plush Purses make a great addition to the event!! The Plush Purses from Aurora are just way too cute! 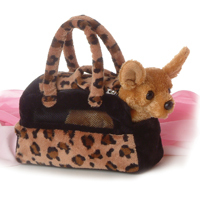 They are fashionable pet purses with adorable plush animals inside them! At Aurora they have a huge selection of these adorable Plush Purses. So whether your little Diva loves dogs or cats, or horses or wild animals, they have a great selection of animals to choose from! And the purses that these adorable plush animals come in are also very cute! Perfect for any little Diva who is ready to go out and show off their sense of style and fashion! The wonderful people form Aurora feel the same way and to help celebrate the Princess Party Event over here at Mommy Katie by giving one of my awesome readers their own Plush Purse!! Head over to Aurora and tell me which of the Plush Purses you like the best!! Leave me your email with this entry! This giveaway is open to US residents. This giveaway will end at midnight on February 15,2011. Winner will be chosen at random.org and will be given 48 hours before another winner will be chosen. All products for reviews and giveaways are given as a sample from the companies. All opinions in reviews I conduct are my own. I was not paid to say anthing or review any products. Previous Post Valentines Day: My Teddy Gram Review + Giveaway Closed! Following on GFC with katklaw777.